What SETI can learn from evangelical sports fans. What evangelical sports fans can teach us about reaching out to extraterrestrial life. 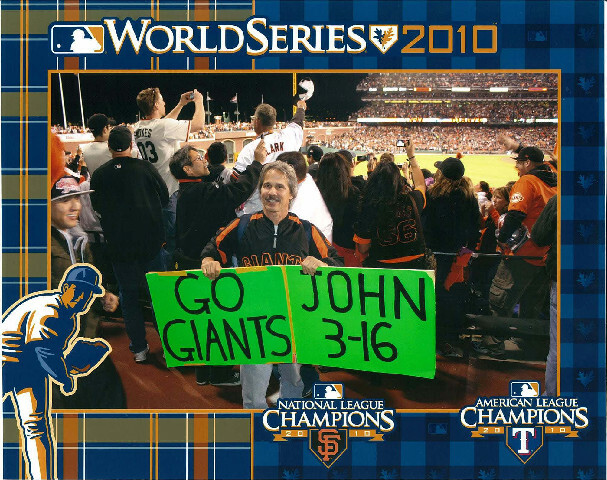 Have you ever seen somebody in the stands of a major sporting event holding a poster that said “John 3:16”? It’s kind of like what an extraterrestrial broadcast should look like. Photo illustration by Lisa Larson-Walker. Photos courtesy of NASA, by Getty Images. The Search for Extraterrestrial Intelligence, popularly known as SETI, scans the skies looking for some evidence of ET. Finding a beacon sent out by another civilization has been a kind of holy grail for these researchers. It seems odd to use a religious metaphor when talking about SETI, but perhaps there is something that religion can teach us about it. I spoke with him at length about his strange occupation. It was his full-time job. He lived very simply and traveled as cheaply as possible. He was not a sports fan. Attending a World Cup or World Series meant nothing to him. He spent most of his time roaming around the stadium from place to place where he thought the cameras were most likely to take a close-up of the action, such as behind the goal or home plate, etc. In some venues he also had to be alert for hostile security. But in many he was welcomed by the stadium staff, especially in Latin American and European countries with strong Roman Catholic populations. In some cases, he said, he had worked out a deal: After he got into one shot, he was done for the day. The staff would sometimes even allow him special access to good spots where everybody watching the game on TV would be sure to see him. I design SETI messages for a living. These are messages for future humans or alien beings far away in space and time. My challenge has been to find a way to present information that is obviously a message, is understandable without much effor, and conveys the intended contents: for ETs (Voyager Golden Record and One Earth Message); future human colonists of Mars (three sundials and one DVD called Visions of Mars; humans in New Mexico for the next 10,000 years (WIPP Nuclear Waste Warning Marker). 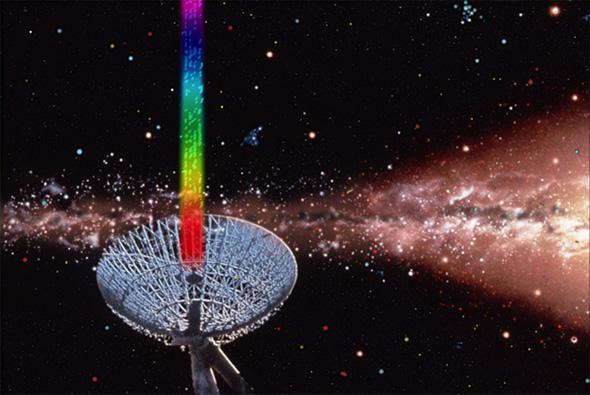 Search for Extraterrestrial Intelligence: A radio-telescope transmits a digital message to the stars. Given my job, it’s not often that I meet somebody with an even more unusual profession than mine, and I couldn’t help but applaud the brilliance of the scheme. It’s really just a link to the core Christian message in the Bible, delivered easily and cheaply to a respectable fraction of the world’s population. His white poster with eight black characters stands out against any surrounding background. The message is shown at a time and in a place where a great many people would be looking at a specific spot he could guess with accuracy—behind the goal, behind home plate. In fact, if you watched only one major sports event a year, you’d still have a pretty good chance of seeing his sign. His single, cheap poster could effectively reach hundreds of millions of people per year. He could do it without the permission of stadium owners, FIFA, or Major League Baseball. The message was concise and anyone using the Latin alphabet would read quickly and remember it. It was loud, brief, cheap, and clear. Friendly to the bureaucracy. By getting informal permission from well-disposed stadium staff, he keeps the process simple, avoiding the nightmare of trying to get official permission from organized sports corporations. How might ETs desiring contact engineer their beacon signals to maximize detectability? What might that tell us about the senders? Re-examining our list in reverse order, ET senders don’t have to be the leading scientists or social leaders of their race, but instead might be small groups or even individuals—so long as the transmission costs are cheap enough for them to fund. A brief radio beacon can be very bright, and the briefer it is, the less it costs. It’s probably just a beacon to convey the message WE ARE HERE, at which point we train more instruments on the source and study it very closely. The beacon has done its job. Physicists James, Gregory, and Dominic Benford have addressed the issue purely from the perspective of transmission costs in Astrobiology. If ETs care about cost, they will likely use the kinds of very bright but very brief beacons now known as “Benford Beacons.” They will be an important consideration in the design of future searches. A radial search strategy for interstellar beacons: Civilizations sharing a common galactic radius can find each other more easily because they have a specific direction to target their searches. It’s also worth remembering that loud signals will inevitably annoy any other ears near the transmission source. The energy and equipment required to send out a really strong and bright pulse might be too expensive and too noisy to have in continuous or frequent use. Stadium staff are friendly as long as Bill flashes his John 3:16 message just once or twice per game. If he wanted to be on camera more frequently, he’d be more intrusive and less welcome. Going back to our list of beacon requirements, the one we have not discussed for SETI is the first: Bill takes his sign to major sporting events that he knows will be watched on TV by many millions of people. So what is the equivalent of the World Cup for SETI? Observers have suggested several preferred directions as “the place where they will look.” There are two ways to isolate events so they will plausibly be more likely to be seen: time and space. Consider using time to point to a SETI signal. When we are looking at some spectacular or important astronomical phenomena, every civilization directly behind or ahead of us is looking that way, too. That sets a time: radiate powerfully in the direction that is looking at a recent event—perhaps a nova star, or even a supernova. Say such an event occurs in our night sky. Look away from it by 180 degrees—that is, into the sky that will receive the nova brightening as its light passes us and goes to them. Send a beamed message along that same direction, following the nova’s light. A radio beam less than 1 degree wide is like a skinny straw laid down to form a radius of the galactic disk. Lay it down anywhere, and it will encompass billions of stars. Now lay it down so it contains the sun. Any other civilization in the radio beam now has a preferred direction in which to find any other civilization among those stars. For example, all astronomers in the galaxy will surely study Supernova 1987A in the Small Magellanic Cloud. So we could look along that beam for anybody else. My own favorite preferred direction is the beam that connects us to the galactic center. The one common directional concept everyone in our galaxy will have is the direction toward the center of the Milky Way—and as well, the galactic “anticenter,” in the opposite direction. Each radius of the galaxy can be thought of as a wide avenue leading directly to the center of things. It will be easier to find anybody else who lives on the same avenue as we do. But I think the avenue probably ends at the center of the galaxy, because of the difficulty in sending any electromagnetic signal directly through it. 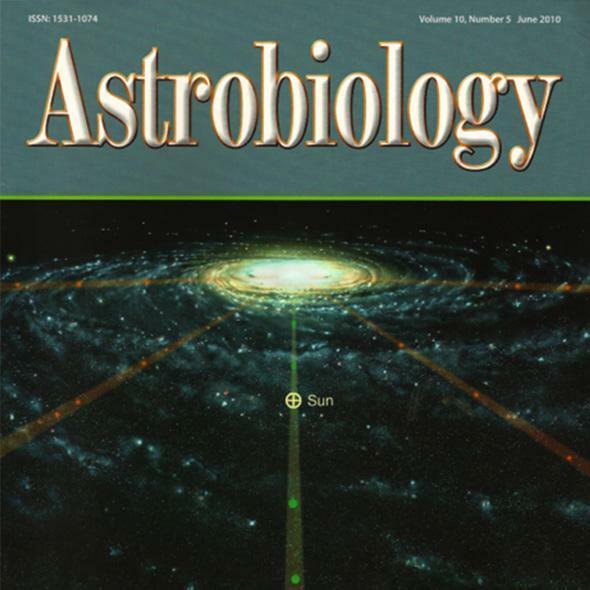 I illustrated the concept for a paper in the journal Astrobiology. The artwork shows several galactic avenues, with bright spots marking the location of civilizations that reside along that avenue. Even though the galaxy’s differential rotation will cause civilizations to pass in and out of the beam, they will remain in the beam long enough for a message to travel the length of the avenue. That time is measured in 102 to 104 year increments, while stars take 105 to 107 years to move across the beam. Of course once you acquire the signal, you simply track the target civilization’s star even when it moves off the avenue. There is one more problem: The man carrying the John 3:16 sign will be seen by anyone watching the entire World Cup game. 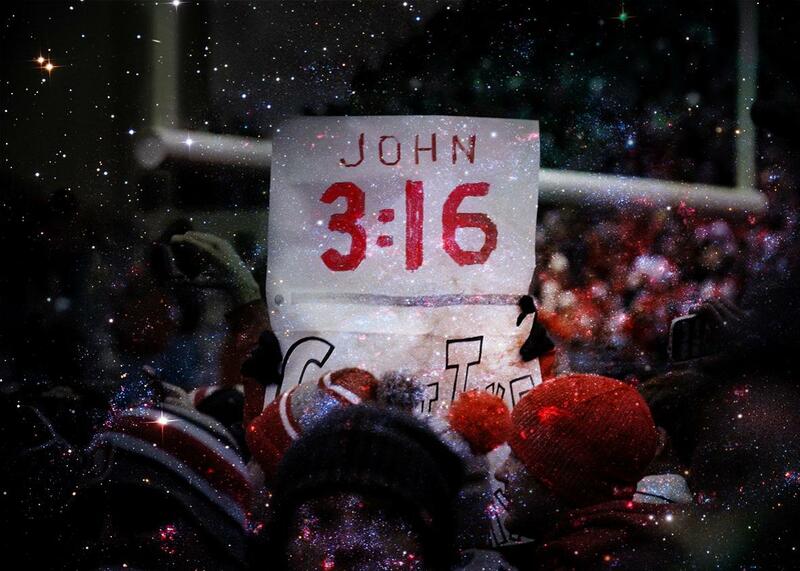 But a viewer who watches the game for only a few seconds is likely to miss it, since you cannot know ahead of time when the great goal or save is made, with John 3:16 clearly visible in the background. You have to watch the whole game. In SETI terms, this suggest that the most important consideration is the dwell time—how long a SETI project looks in some preferred direction. The good news is that you don’t need to use Arecibo to detect the beacon. Benford Beacons will be so loud—very briefly—that any medium-grade instrument will detect it. You need three antenna spread around the planet to keep any special location in continuous observation—like NASA’s Deep Space Network, whose three telescopes in California, Spain, and Australia keep an uninterrupted vigil as the sky wheels around us. If you ever detect a possible beacon, you have to remain on target long enough for it to repeat—and who knows how long you have to wait? For an ancient and long-lived society, with perspectives far longer than our 10,000-year civilization, that might be a long time. Their notion of patience might be very different from ours. They’re aliens, after all. Of one thing I am sure: Any brief, potentially artificial signal should be closely watched for a repeat. A new approach to SETI could involve unbroken observation of some of the special directions on the sky. NASA’s Kepler telescope’s success in discovering 1,000 new planets depended on a long period of uninterrupted observation of its target stars. Only constant monitoring could detect the small percentage of stars having planets that revealed themselves when they crossed their star’s disk. This is precisely the advantage that the SETI projects I favor possess. You’ve got to be listening when they are transmitting, so if you don’t know when that is, you have to listen constantly. Such a strategy was also suggested by Arthur C. Clarke in his novel The Fountains of Paradise, called Project Argus after the thousand-eyed sentinel in Greek mythology. In discussions about SETI beacons and messages, some have suggested that religious gospel is one possible motivation for ETs to establish beacons. Currently astronomers worldwide have largely agreed on an informal moratorium on sending beacons from Earth out to the Universe until the issue of potential threats such beacons might invite has been discussed more thoroughly. But if the moratorium is lifted, and anyone who wishes can hire the use of a suitable transmitter, among the first contents will certainly be the gospels of many faiths. People have been proselytizing for millennia, and they have learned a thing or two about how to do it. No doubt they will exploit this new form of “media” to transmit their gospel in the widest arena. Perhaps SETI beacons may turn out to be largely operated by ET evangelists. And perhaps SETI can learn something from the gospel distribution strategies useful in determining their own. There has always been something faintly theological about the SETI enterprise. As many rationalist people have rejected the God hypothesis, some have replaced it with a wise, ancient, powerful, and benevolent galactic civilization, for which there is as much evidence as there is for Jehovah. The key difference is that there is an experiment to find the ETs and therefore provide empirical proof. It’s called SETI. That will prove the ET hypothesis while the Jehovah hypothesis can be proven only by a miracle—literally. Those searching are more concerned with the problems of finding ET’s signal than with what it might contain. But when ordinary people think about the ETs, they often think in terms that are very close to godlike. In 2005 Cosmos magazine in Australia organized a project to send almost 26,000 short text messages toward Gliese 581d, one of the planets discovered by NASA’s Kepler telescope, distinguished by the possible presence of an ocean of liquid water. There were many thousands of submissions from all over the world. One of the most common messages was really a kind of prayer, asking ET to save the world, or the asker, or both. Salvation from ETs in the faraway sky is a tempting substitute for divine intervention. In both cases it eliminates the need for any action on the part of the person—or the planet—with the problem. Like it or not, we’re on our own.